WPC is the subject developed globally with its main base in Exterior products. 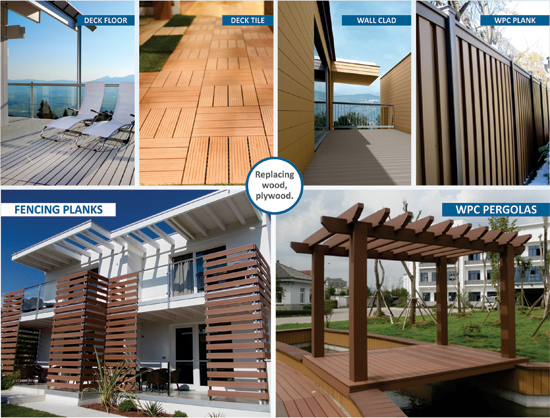 WPC CENTRE serves the industry with WPC decking products with own products and installation teams. Working closely with architects and developers, we take up turnkey projects for WPC installation in exterior applications. It covers WPC Flooring, wall cladding, fencing, pergolas, gazebos and even furniture. Trained workforce of the company helps architects establish their projects with state of the art installations for Decking products. Material is made with PP based wood polymer composites and best replaces direct applications of natural wood. Learnt from its alma mater HARDY SMITH, WPC CENTRE is actively promoting the subject amongst the architect and interior community. We supply WPC decking material in customised colors and finishes, followed by custom lengths.